I started working on Generation Ship right at the beginning of this year – in fact, I think I remember spending some of my New Year’s Eve on initial concept work (I’m so cool). Back in those early months I set June as my ideal goal for finishing the game and getting ready for submission. I think I knew at the time that this was a little on the ambitious side. This is by far the largest project I’ve ever managed myself and the continued sprawl of scripts and assets is occasionally alarming. It looks likely I will need another couple of months to get the game to 1.0, but I fully intend to stick to the more vague release window of “Summer”. In the last few weeks I haven’t added too much more in the way of whole new features, rather fleshed out things that were already part of the picture. 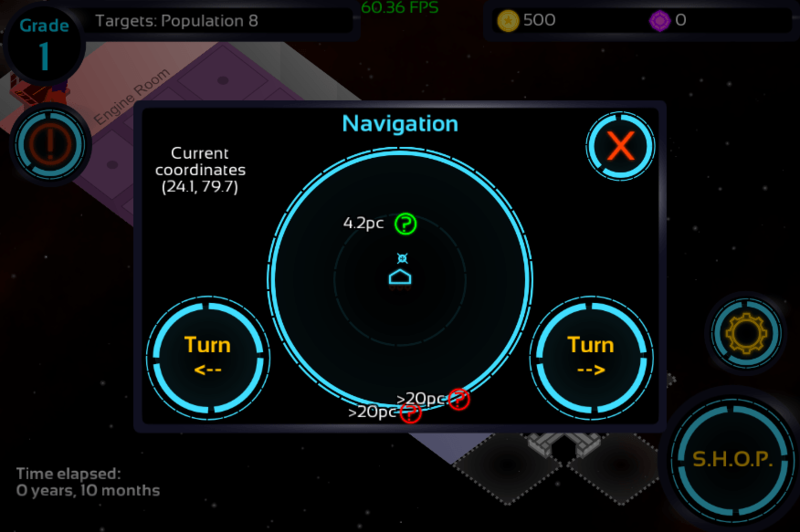 The navigation system is now functional: this is something of a game-within-the-game where the player can have some interaction with the universe outside the ship. Probes can be deployed to retrieve materials from objects visible on a long range radar – these materials have some value that can then feed into the economy of the ship as currency. To play this radar game the bridge must be staffed, and additionally turning the ship towards a new target requires the engine room to be staffed. For these functional rooms, this is the primary reason to assign colonists to work in them. The next stage of development is in deepening the content of the game: the sense of progression through the game is not yet there so a couple more rooms will need adding at least. Hopefully next month I will bring an update from a game that is close to completion! This entry was posted in Generation Ship, Work In Progress by Paul. Bookmark the permalink.